For centuries, the indigenous Indian tribes would intentionally burn the forests every year. Perhaps they knew that if a fire got out of control, there was no way to stop it. The great eastern forests when Europeans arrived were large open areas underneath the canopy of trees. All underbrush and fuel was kept at a minimum with the annual burnings. After the Indians were displaced and the annual burnings ceased, the forests became choked with underbrush and dead timber. It seems that the environmental movement has made the idea of pro-active forest management something that we should not do. The goal seems to be to remove all traces of man’s effect on the environment, both good and bad, and return the world to a ‘natural’ state as it existed before we evolved. This is the underlying philosophy behind the State of California’s forest management practices, and explains why they consistently ignore arguments to do controlled burnings to keep the fuel load at a minimum. Similarly in Australia early explorers noted that there was always smoke somewhere. The aborigines were burning the bush undergrowth as the eucalyptus trees are largely unaffected by small fires, and this burn-off meant easy travelling under the trees and easier to find game. The eucalyptus trees benefitted too, gaining an advantage over competitive species which, in the dry climate areas, led to their predominance. Where rainfall was heavier and more reliable the rain forests wouldn’t burn and were almost impenetrable. When working on my PhD in plant ecosystems at The University of North Carolina at Chapel Hill, my research work was vegetation on diabase in the Gettysburg Basin area of Pennsylvania west of the Susquehanna River. I found an account by a military party in the 1600’s in the PA area which said one could ride for miles through the forests without ducking. They talked about the smell of smoke and the haze from smoke in the late summer and early fall due to the burning. The Indians burned for ease of travel, game habitat and also ease of travel north and south to make war on each other. Also about the same time there was published symposium on the eastern forests. Finally, scientists had come to the conclusion that the landscape was a patchwork of uneven-aged forest stands due to disease, insect outbreaks, windthrow (especially in hurricane areas) and fire. While there were large areas which were the “primeval” dense forests so romantically envisioned, there were even larger areas which were not. How can that not be a POLITICAL advert for Climate Alarmism ? The Era of Megafires (EOM) is a multi-media presentation that combines the research of Dr. Paul Hessburg (Pacific Northwest Research Station, U.S. Forest Service) with the visual storytelling of award-winning film company, North 40 Productions. Utilizing animations, graphics and video vignettes, . . .
We went to one of the first presentations, in 2016. The Santa Monica Mountains (as well as many other California Mountains) are generally sparse in trees. However, they are lush in bushy and grassy growth (and sometimes wildflowers) during/after generous winter rains. At such times, these mountains are in their glory with beautiful, lush green landscapes. This has been the case during the past 3 spring seasons. By the time June rolls around, however, there is no rain to be found (it’s simply the nature of the desert climate), and the grasses quickly dry up, leaving behind dust and highly flammable shrubbery. One visiting these mountains during August, and then again in March might wonder if they are actually in the same place as the scenery (as well as the air temperatures) differ dramatically. I am not able to conceive of a practical way of “clearing” or “thinning” these mountains of this vegetation to prevent fires (although one may, indeed, exist). There are generally limited “forests” of trees to thin. In “typical” forests, there is at least is the possibility of some level of financial benefit in selectively foresting timber that has some market value. And, while I know we must look beyond strictly economic outcomes while enacting policy, it is a great victory and realistically more attainable when creative solutions are found that are also financially desirable. Controlled burns may be useful and perhaps practicable, but in my humble mind, when I see the vastness of the mountain lands, it is difficult to conceive of realistically accomplishing this. Additionally, in this highly populous state (which is not, by any means, an ecologically desirable situation but is, indeed, reality) the spring/summer/fall air quality is poor enough to cause those with even the mildest case of COPD (such as myself) to have serious health issues without adding the the burden of particulate pollution from burning. It seems that it is the very nature of these desert mountains to grow lush, dry up and sometimes burn. They are simply subject to flammability, ESPECIALLY after a particularly rainy season. This goes against what most would perceive to be logical. One normally thinks of the land being LESS susceptible to wildfires when rain is plenty – and more susceptible to burning during drought. But, if one takes into account the vegetation growing in these desert mountains, it starts to make perfect, rational sense. I am not a Forestry expert, and certainly have not spent my life doing anything remotely close to Forest Management; However, 2018’s Woolsey Fire and 2017’s Thomas Fire burned following very generous rainy seasons in mountains that grew stunningly green and lush, but then turned quickly to dry brush in the summer months. While I know there are pockets in these mountains thick with trees, much of what burned – was sparsely forested, and the winds were able to carry the raging fires across the rocky, dusty brushy surfaces at speeds beyond comprehension. It is, more often than not, essentially important to correctly identify the nature of a problem (which will always be multi-dimensional) in order to even begin to identify useful solutions; And while I recognize the California wildfires as a situation most worthy of attempting to remedy, I am baffled and frustrated to continually hear and see causes identified that are not only over-simplified, but fly directly in the face of my reality — having camped in and around these stunningly lush, green mountains during March/April, 2018 (at which time I read that at least one reservoir in the area was forced to spill off water after reaching record high levels) — as well as being present in summer months and witnessing the stark differences. While it may not sound as devastatingly hopeless and apocalyptic, and lacks the sensationalism of assigning unforgivable blame, it would be so refreshing to have these wildfires, which have caused unmentionable grief to so many, discussed rationally, thoughtfully and honestly at a public level. In the USA, over 80% of wild fires, somehow or other, are related to people and their doings. Prevention aspects directed at people will be easier than most other methods. Where it is known people will be, clearing is helpful. The Chaparral or Mediterranean Sclerophyll Forest Formation is fire maintained. In the past it was maintained by frequent flash fires which were fueled by the resins in the leaves of the shrubby plants. These species sprout up from the roots under these situations. The problem comes when fires are suppressed and a lot of fuel is allowed to build up. The US area burned by forest fire annual trend plunged from the 1930s and had remained relatively low until 2000. This is annoying because the loggers would pay for contracts to strip out fire-breaks and clean up deadwood. Flooding is another (largely) avoidable problem, it’s just a piece of cake to dredge rivers, use the dredged silt to build up the river banks, or even use the silt on the fields to condition the soil. More than dodgy– demonstrably incorrect. No CO2 whether from man caused forest fires or naturally ignited burning coal seams stays in the atmosphere more than 4 or 5 years. The recent rate of growth in the atmosphere is about 2 PPM. Equal to about half of human emissions or a quarter of emissions from termites. It is also about 3% of natural emissions which vary widely from year to year but are substantially controlled by temperature-mostly sea surface temperature. If the CO2 from forest fires were somehow different from CO2 from warming oceans and built up in the atmosphere we would have concentrations not seen for several million years. We don’t so we have to conclude that the sinks almost equal the sources and fossil fuel emissions of the same molecule are distributed in the atmosphere about in the ration of the emissions- about 3%. No doubt this will all be explained by that well known entertainer David Attenborough in his forthcoming TV show “Climate Change: the facts” BBC1 9.00pm Thursday. Get in the popcorn. 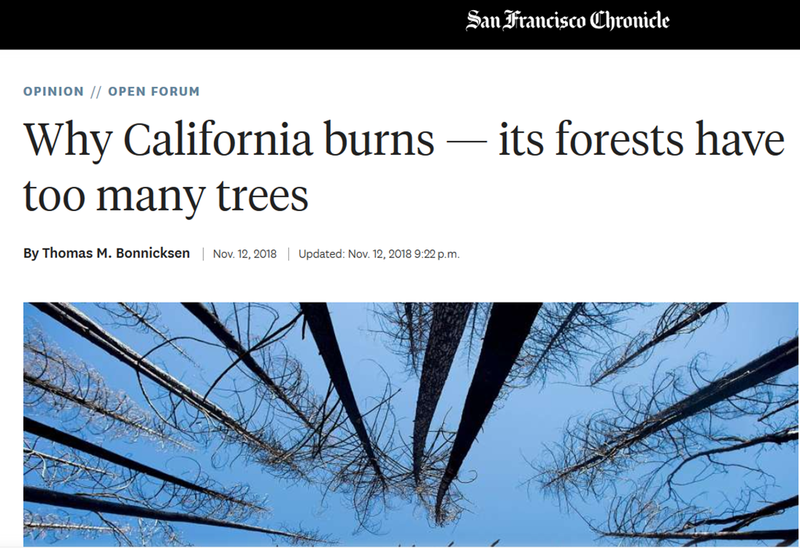 Obviously, we need to start pelletizing every tree and bush in California, shipping them across the entire continental USA, loading them into boats, shipping them across the Atlantic, unloading them into trucks, shipping them to Drax, and burning the lot over there. The only question is if both countries get to count the CO2 savings that must result from this effort.